Esther Green, 88, of North Vernon passed away Thursday, January 24, 2019 at The Waters of Dillsboro - Ross Manor. Esther was born Sunday, June 29, 1930 at Versailles the daughter of Louis and Martha (Lingo) Struckman. She married Garnett Stanley Green June 1974 and he preceded her in death December 29, 1985. She worked as a welder for Gateway Engineers at Miamitown, a former employee for Seagrams and Anchor Glass in Greendale. 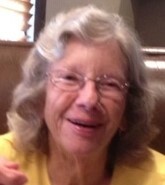 She enjoyed gardening, flowers, antiquing and yard sales. Esther is survived by daughter Elaine “Tinker” (Gerald) Sutton of Dayton, Ohio; 3 grandchildren and 9 great-grandchildren. She was preceded in death by her husband Garnett, parents, brothers Hap, Millard, Roy, John, Jim and Estol Struckman; sisters Ruth Ekstrand, Luella Richter, Mary Brewington, Grace Askins and Catherine Fischer; Edward Huge long-term relationship and good friend Earl Rice. A service celebrating her life will be held 1 PM Monday, January 28, 2019 at Laws-Carr-Moore Funeral Home in Milan with Pastor Harris Long officiating. Burial will follow at German Lutheran Cemetery North of Milan. Family and friends may gather to honor and remember her Monday 11 AM - 1 PM also at the funeral home. Memorials may be given in honor of Esther to The Waters of Dillsboro - Ross Manor activity fund. Laws-Carr-Moore Funeral Home entrusted with arrangements, 707 S. Main Street, Box 243, Milan, IN 47031, (812)654-2141. You may go to www.lawscarrmoore.com to leave an online condolence message for the family.